Keratin Treatment is a universal product that can be used safely on any type of hair: dry, frizzy, overly retouched, colored or natural. On almost all types of hair you can get the same results or hair : healthy, shiny, frizz-free and easy to comb. 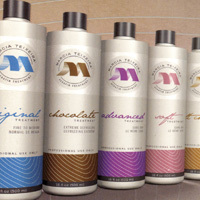 With the Marcia Teixeira ® treatment is virtually no risk of damaging or breaking your hair, provided that the product is used correctly. The Keratin Treatment is long lasting and is a reversible treatment that depletes over time without damaging the hair. Recommended for medium length hair and naturally wavy, gently softens curls. Leaves hair healthy and shiny, frizz freeing effect. Recommended for very curly and thick hair types with a coarse texture and durable. Contains natural antioxidants and a special blend of amino acids. Formaldehyde free, recommended for medium hair texture. Specially formulated to reduce frizz without completely eliminating curl. Extra gentle treatment that softens, smoothes, and leaves hair shiny. The hair can be washed in the same day. Formaldehyde free, recommended for medium and texture to the hair very big or strong. Use cocoa butter. Specially formulated to reduce frizz without completely eliminating curl. The hair can be washed in the same day. Recommended for those who have an active lifestyle. Can be used on all types of hair, specially formulated to create immediate results. The hair can be washed the same day of treatment.